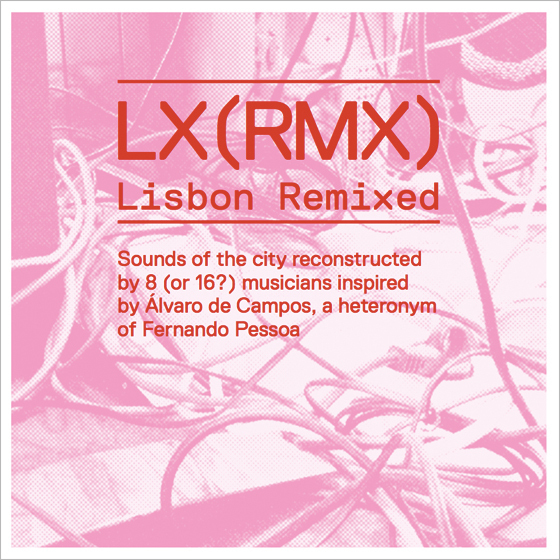 LX(RMX) / LISBON REMIXED – Sounds of the city reconstructed by 8 (or 16?) musicians inspired by Álvaro de Campos, a heteronym of Fernando Pessoa. Home » Blog » LX(RMX) / LISBON REMIXED – Sounds of the city reconstructed by 8 (or 16?) musicians inspired by Álvaro de Campos, a heteronym of Fernando Pessoa. Featuring music by Steve Roden (aka In be tween noise), Pedro Tudela (akaJohnny Days), Robin Rimbaud (aka Scanner), Kate Carr (aka The Frigatebird), Shawn Kelly (aka Y?Arcka), Marielle V. Jakobsons (akadarwinsbitch), Paula Daunt (aka Agnosie), and João Ricardo (aka OCP), all working from a shared set of sounds collected and constructed by Elvis Veiguinha. Veiguinha’s field recordings originally served as the score for an installation of photos of modern urban Lisbon by Jorge Colombo. A 16-page PDF including images from the exhibit that inspired this project is available for free download from archive.org. The full album is available for free download as a Zip file of MP3s, and as individual files, at freemusicarchive.org. Unlike Walt Whitman, Fernando Pessoa may not have contained multitudes, but he had a tidy set of alter-egos. He wrote under a variety of names, each with a unique biography and aesthetic. These alter-egos are referred to as “heteronyms,” and among them was Álvaro de Campos, whose poetry inspired Jorge Colombo’s photography exhibit, Lisbon Revisited, which in turn inspired this compilation album. Heteronyms—in the form of pseudonyms and monikers—are commonplace in electronically manipulated music. Matters of identity are routinely amplified and distorted by various factors: by the semi-anonymity inherent in online communities, by the rampant splintering of genre taxonomy, by the manner in which authorship is complicated by reliance on third-party (and often emerging) technology, by the prevalence of sampling and remixing. In tribute to Pessoa and Campos, eight electronic musicians were commissioned to explore the sounds of the city of Lisbon, as well as the creative opportunity inherent in the concept of the heteronym. The eight musicians and their eight adopted heteronyms each took a single shared sound source and created from it sixteen new audio works. The shared sound source is an ambient soundtrack of field recordings of urban Lisbon created by Elvis Veiguinha for the installation exhibit of Colombo’s photographs. This project gave each participating musician the opportunity to explore not only the sounds of the city, but also their own internalized multiple viewpoints. In January 2009—just a few weeks before I started finger-painting NYC on an iPhone—my exhibition Lisbon Revisited opened at Casa Fernando Pessoa, a museum in Lisbon, Portugal. Based on the early 20th century poems by Portuguese poet Pessoa (writing under the name Álvaro de Campos), the show consisted of Lisbon photographs of mine in which I tried to forget all personal associations and memories of my hometown, focusing instead (like Pessoa/Campos, a fervent futurist who worshipped the splendors of Progress) on the most contemporary, most technological, most globalized aspects of my hometown. I shot today’s Lisbon like Campos would have, were he not a fictional poet stuck in he 1920s. The exhibition’s soundtrack was created by Elvis Veiguinha, a Portuguese sound artist, music producer, and filmmaker, who used his recordings of Lisbon’s aural atmosphere. Meanwhile, in San Francisco, Disquiet’s Marc Weidenbaum has been forever perceiving Pessoa as a 21st century artist who happens to be have been dead since 1935. Veiguinha’s soundtrack became the natural link to revisit Pessoa’s Lisbon through the more recent vocabulary of remixing. This release is licensed/ Attribution-NonCommercial-ShareAlike 3.0 Unported (CC BY-NC-SA 3.0). Lynch Dough around Sweden inside "Trailer Gallery"